We all know who won the awards at the Oscars but who were the stars that won the night on social media? 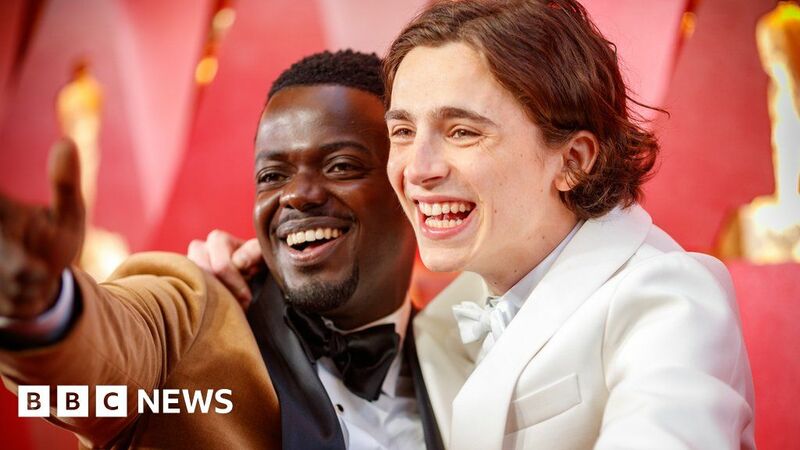 He missed out on the best actor award to Gary Oldman but Timothee Chalamet was the most tweeted about celebrity on the red carpet, according to Twitter. He certainly looked like he was having the most fun. James Ivory, who won the best adapted screenplay Oscar for Call Me By Your Name, in which Timothee starred, wore his face on his shirt – which went down a storm. His reunion with his Call Me By Your Name co-star Armie Hammer on the red carpet also made a lot of people very happy. There was a lot of love for Timothee at the ceremony too and it seems he made sure he introduced his mum (aaaw!) to all the big names. They weren’t eligible to be nominated for this year’s Oscars but the cast of Black Panther didn’t let that stop them from reigning supreme on the red carpet, with the resulting hashtag #WakandaForever. Chadwick Boseman was the second most tweeted about star on the red carpet. He and his co-stars Lupita Nyong’o, Danai Gurira, Daniel Kaluuya and Winston Duke looked like Wakandan royalty. Danai Gurira and Lupita Nyong’o also had a good old catch up with Daniel Kaluuya on the red carpet. 3. Tiffany Haddish next year’s host? Tiffany Haddish also had a moment on the red carpet – and pretty much everywhere else she went at the Oscars. She arrived in a traditional Eritrean dress to pay tribute to her dad who died last year, before changing her outfit to present an award with Maya Rudolph. It was a more traditional affair… apart from the furry slippers. A lot of people on Twitter had time for those. Hands up if you’re feeling the Uggs! Tiffany and Maya’s double act went down a storm and many are convinced they should host next year. Haddish changed her dress yet again for the after parties, where she and best actress winner Frances McDormand shared an… erm, interesting greeting. Haddish also caused a stir on the red carpet when she crossed the velvet ropes to get to greet Meryl Streep. Another star who wouldn’t let barriers stop them seeing the Hollywood matriarch was Jennifer Lawrence. Extra points for balancing the wine glass. This year’s set design drew a lot of attention on Twitter. To celebrate the 90th anniversary of the awards, set designer Derek McLane used 45 million crystals in his sets – each of which was meant to reflect a different era in the history of movie making. Jillian Leff was one who tweeted: “I don’t care about anything except the stage design”. Many suggested it should be up for an award in itself – including Katy Perry. But not everyone was so keen – Jen Castle was one: “I’m sorry but there’s way too much going on with the set design tonight. It’s like the Rococo era threw up on the stage”. History was made at the Oscars when Daniela Vega took to the stage – she became the first openly trans woman presenter in Oscars history when she introduced Sufjan Stevens’s performance of Mystery of Love from Call Me By Your Name. Her film A Fantastic Woman also won the best foreign film Oscar. Wow. I didn’t expect this, but seeing a trans actress on stage at the #Oscars just moved something deep inside me. It’s possible. It’s possible. It’s possible. Big congrats to @danivega and the whole team! Patricia Arquette, whose late sister Alexis Arquette was a trans pioneer, was particularly happy. The Shape of Water Director Guillermo del Toro was the second most tweeted-about star at the ceremony. He won best director and best film. But after last year’s mess up, he was taking no chances and checked his envelope to make sure. Host Jimmy Kimmel’s offer of a jet ski to whoever did the shortest speech went down well. Dame Helen Mirren had the job of modelling the prize. The winner was Mark Bridges who won best costume design for Phantom Thread. His speech comprised four words: “Thank you very much”. *Helen Mirren not included. Ts&Cs apply. He told the BBC’s Rebecca Jones that it’s all official but he has no idea how to get the vehicle home. Media captionMike Bridges was magnanimous at BOTH his night’s wins. Her flowing royal blue gown landed her on the Oscars best dressed list but it seems Jennifer Garner will be remembered for the moment she had a life-changing revelation, mid-ceremony. Left the hob on? Forgot to pick up mum en route to the ceremony?? We REALLY want to find out what she was thinking about. The actress turned heads at the Vanity Fair party when she revealed a massive tattoo demonstrating her commitment to the Time’s Up movement. It got everyone talking – partly because it was Hermione with a massive tattoo – but also because it didn’t adhere to standard punctuation rules. There was also much debate over whether or not it was real tattoo. The consensus seems to be it’s semi-permanent. She might have to add the apostrophe with a sharpie. Finally, a social media star who wasn’t even at the Oscars. We’re guessing the Home Alone actor wasn’t invited to the big event but that didn’t stop him from dressing up at home as if he was. He tweeted for seven hours – making a lot of jokes and quite a few digs at male stars tied to sexual harassment charges in the movie world. Praised as “brilliantly cynical” he likely gained a lot more followers but with lines like this we’re not sure he’ll be getting an invite to next year’s award either.